"Save Data loading failed" - How do I fix this? I only save after standing completely still for about 10 seconds, if the "saving" icon stays on the top of the screen for a loooong time you have to try waiting it out, then saving again. I have had 0 issues with save files on game files I've had since day 1. My theory is that the game can't save properly while things are still loading and popping in. The only time I got the long save was when facing a long hallway into a moonpool and then into an observatory. I tried waiting for long save to go away and faced a wall, waited 10 seconds and saved again. Hope this helps, either I'm extremely lucky or I've found a loophole. Is there anyway to recover my save file? It seems to be corrupted to something to that degree. 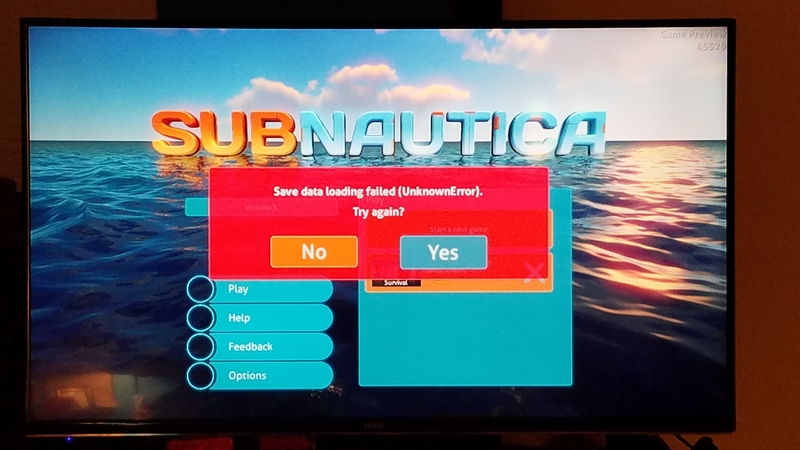 I try to load my game and it says this: "Save data loading failed (UnknownError) Try again No or Yes"
I don't want to play a game that can't properly save my progress. Extremely frustrating and am regretting buying this game. I hope this issue is resolved soon. yeah, this issue usually happens to saves that are in the 3-18 hour range. sadly, my 13h save got attacked by it.i have no idea how to retrieve it, sadly. i do not regret buying the game, but i regret not playing it over 18h. and i don't wanna restart, since that save has 13h of my life in it. even if i can retrieve a previous save, maybe 3 hours back, i would be so happy. Yeah it happens to me when I use the developer menu or developer commands. It seems to me that the way to avoid this error is to not interrupt or do much in your game while saving. When you hit save, only the immediate area you are in stays loaded; terrain after a certain distance will not load. You can continue to do things in your immediate area if you intend to keep playing, but if you are done your session, it is important to let your game save fully before powering down or doing much else on your Xbox. I only get this load error if I exit the game early or load other resource intensive apps on the dashboard. Ultimately, I feel there are two related issues: a) the saves are so long that people get impatient (not surprising when the saves last 10+ minutes on Xbox), and b) the game offers no way to recover/load the previous save should the most current save become corrupted. I have a little over 36 hours in my save and this just happened to me I'm not starting a new world because now they have taken the dev console out so I cant spawn my stuff back in I have the seamoth and just finally crafted the prawn this will be a game breaker for me if it doesnt get fixed.